I would like to share my successful bring-up of LLVM/clang-built Linux ARM(32-bit) hammerhead kernel for Android running on my Nexus 5 smartphone. 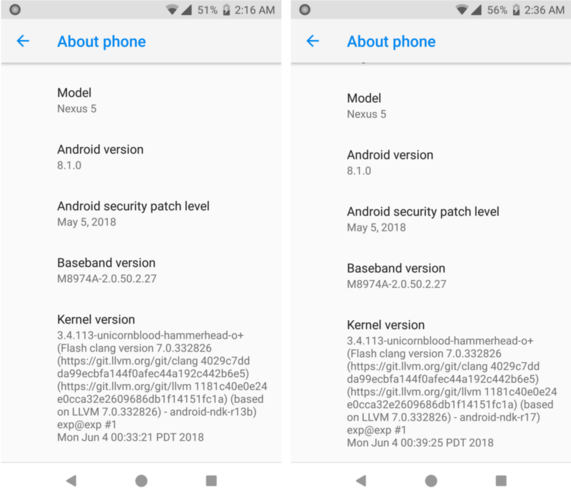 After having successfully brought up LLVM/clang-built Linux kernel(since v4.15.7 to the most recent v4.17) on x86_64, I was interested in accomplishing the same on the ARM platform of my Nexus 5 - Android smartphone. So, here is the complete report of the same for the interested people. I have used different LLVM/clang toolchains/versions in this project of mine, including the Snapdragon/Qualcomm one which is relevant to this community : Snapdragon LLVM ARM Compiler 4.0.2 for Android NDK (based on llvm.org 4.0+) - clang version 4.0.2 for Android NDK from "Qualcomm snapdragon-llvm-4.0.2-linux64.tar.gz"
The main advantage of the clang-built Android ARM(32-bit) hammerhead kernel for my Nexus 5 has been the better battery usage when compared to that of gcc-built kernel, with the same kernel config and hardware(my Nexus 5 Android Smartphone). Details of the same can be found below. 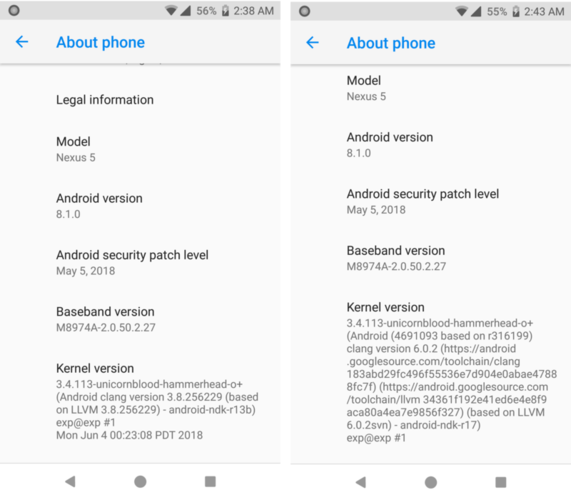 NOTE : By the way, I came across some reports of ARM64 clang-kernel for some Android Smartphones - but, the information over there did *not* help for my ARM32 clang-kernel case of Nexus 5(hammerhead). 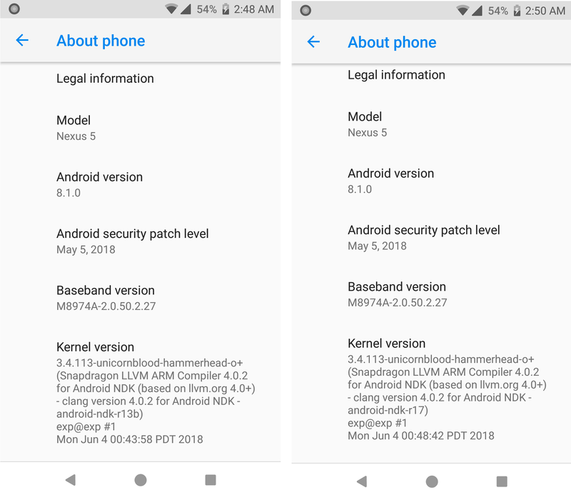 So, I started off this project from *scratch* and it has been lot of *entirely my own original work* to first successfully build the ARM32 clang-kernel for Nexus 5(hammerhead) and second to make it *actually work* on the real hardware - Nexus 5.
exp@exp:~$ sudo dmidecode -t system | grep "Manufacturer:\|Version:"
exp@exp:~$ sudo dmidecode -t processor | grep "Version\|Family:"
NOTE : Analyzing the images by decompressing them based on lz4 magic (\x02\x21\x4c\x18) . . .
exp@exp:~$ cat android1/android1_dmesg.txt | grep "clang\|Machine"
exp@exp:~$ cat android2/android2_dmesg.txt | grep "clang\|Machine"
exp@exp:~$ cat main1/main1_dmesg.txt | grep "clang\|Machine"
exp@exp:~$ cat main2/main2_dmesg.txt | grep "clang\|Machine"
exp@exp:~$ cat qualcomm1/qualcomm1_dmesg.txt | grep "clang\|Machine"
exp@exp:~$ cat qualcomm2/qualcomm2_dmesg.txt | grep "clang\|Machine"
Finding the right kernel source and kernel config that works with the Android version I had on my Nexus 5. => Discussing on the Resurrection Remix forum and with the kernel developer(uname:voidz) to know the actual kernel source used in RR. => Disabling all the intrinsic features that clang uses internally - device rebooted after a failed boot! => Witnessing the device auto-reboot with the above change - must be a kernel panic! => Checking /proc/last_kmsg within recovery mode - yes, it was the clang-kernel that panic'ed - good sign! => Finally, the clang-kernel has started executing after an exhaustive set of attempts - breakthrough! => Seeing Android animation(RR logo in my case) for the first time! => Getting to the Android home screen after few seconds of wait - mission accomplished! => Cheking WiFi - didn't work - "connected, no internet"
=> Verifying phone calls work - yes, they worked! 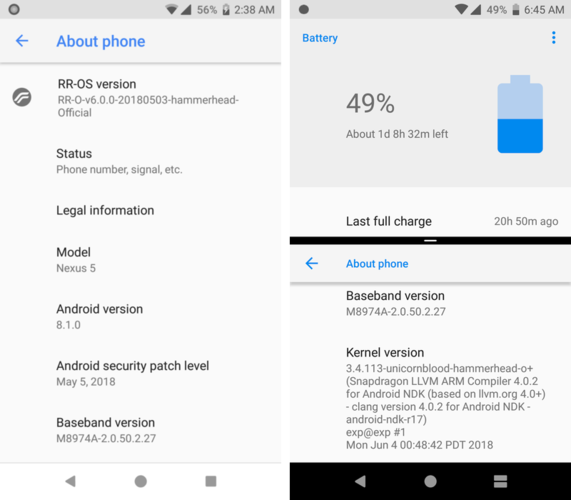 => Rebuilt the kernel - WiFi and mobile network - both worked! Realizing all the features are now working with a clang-built ARM kernel for Android! => Booting to Android home screen this time with even the Android NDK r13's LLVM/clang-built kernel! => Confirming all of the above work - yes, worked! Wrapping my Android clang-kernel research project! => Done and dusted. Period. NOTE: For the detailed research walk-through of this project of mine, you can read more at "https://ubuntuforums.org/showthread.php?t=2394035". Look for [ANDROID ARM LLVM/CLANG-KERNEL ~ RESEARCH WALK-THROUGH] over there.